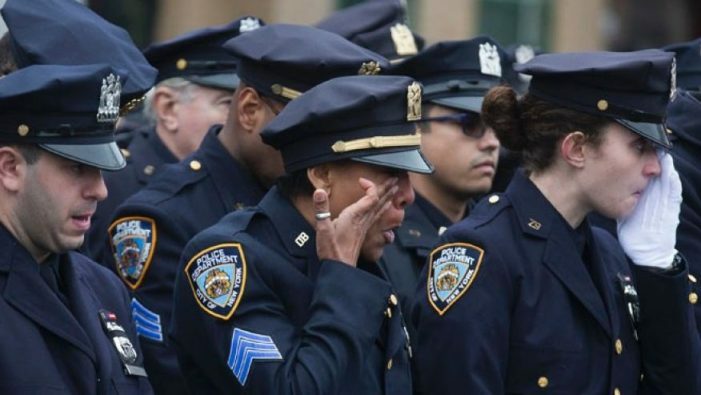 According to a preliminary report from The National Law Enforcement Officers Memorial Fund (NLEOMF), the number of police officers killed in the United States by gunshots increased by 56% from 2015 to 2016. There were 41 police officers killed in 2015 by firearms. That number increased to 64 in 2016. It’s the highest number of firearms-related deaths recorded since 2011, when the total was 73. The NLEOMF data also shows the number of police officers killed in the line of duty by gunshots has increased from 33 in 2011 to 64 in 2016. This is a 94.0% increase. NLEOMF statistics form 2011 to 2016 are shown below. After reaching a 10-year high in 2011 with 73 firearm-related deaths, a two year decline came to an end in 2013. 2 Responses to "Police Officers Killed by Firearms Up 94% Over the Last Four Years"
The war on police is an Obama legacy. He encouraged, incited attacks. He would not let the DOJ investigate officer deaths or paid demonstrators at Ferguson and other violent riots.